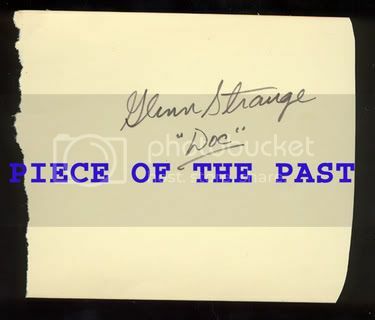 One of our favorite Las Vegas dealers, Piece of the Past has a Glenn Strange signed cut inscribed "Doc." He claims Strange played the doctor on the radio. Uh, on the radio, Howard McNear played "Doc." Stupid forger. I think it's hilarious he pasted his company name all over a forgery.